It’s rare to find a performance that makes you want to experience it again while you’re still watching it. In the interval of Scottish Opera’s La Traviata, I was already checking the dates of subsequent performances. There’s just that much depth to a show like this that I found myself wishing for the ability to pause and rewind, just to take it all in. Giuseppe Verdi’s opera is very simple – young lovers meet, are torn apart by circumstance, and thrown into disgrace. Based on a novel about a real courtesan, the story traces the downfall of the traviata, or fallen woman, as she first gives up her life in the demi-monde then is forced to leave her great love Alfredo. It’s universal, immense and heart-wrenchingly tragic. This is a very traditional staging of the piece, as it retains its setting in 19th century Paris and the original score is used. It’s a testament to the genius of the piece that the emotions within still resonate with people 160 years after its creation. One of the fabulous things about opera is the sheer opulence, and this performance really went for it. From the iconic Brindisi drinking song to raunchy dancing matadors, the audience are pulled into a giddy reality. The sumptuous costuming, grand set design and boisterous partying of the opening scene were all brilliantly over the top and made a lovely contrast to the quieter, more moving second and third acts. It’s in these quieter moments that La Traviata shines. Violetta and her lover’s father Giorgio’s melancholic duet was beautiful and evidently popular with the audience, but for me, the heroine’s solos were the show stealer. Gulnara Shafigullina made for a phenomenal Violetta, and pulled up truly raw emotion that wrapped around me like a blanket. This is the epitome of the melodrama of opera. The colourful extravagance and bawdiness, the lost love and death throes, are all played out to perfection. 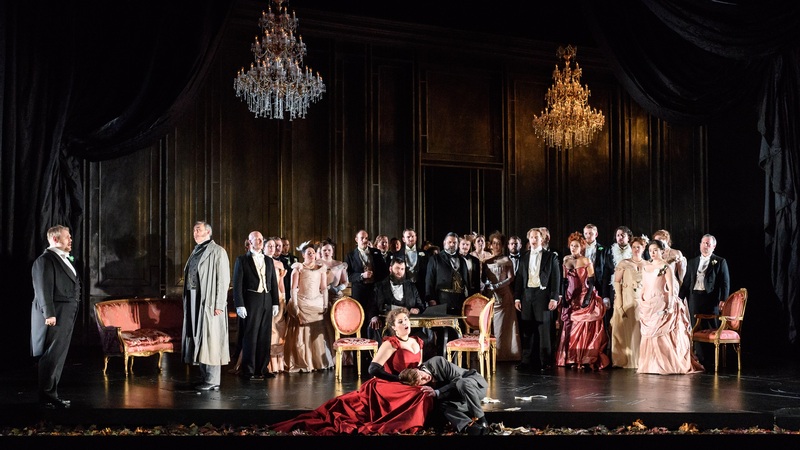 Choking on laughter one minute and fighting off the tears at the next – with truly great opera you get to live in the performance. I can’t wait to live in it again.